« Topsy-Turvy Transit: Where Do We Go From Here? In our previous post, we listed five assumptions that AATA was operating under in its quest for a countywide transit authority. The Regional Transit Authority for SE Michigan either would not materialize or would not affect them significantly. From AATA’s perspective, assumption #1 seemed pretty reasonable to begin with. From the beginning, staff spent many hours meeting with local officials and holding local public meetings. They were assisted by the Executive Director of the Washtenaw Area Transit Study (WATS), Terri Blackmore. (Blackmore is more or less the godmother of the countywide transit plan and knew many of these officials through her professional activity.) They received generally a good reception. A number of local officials allowed the use of their faces in promotional materials and ultimately signed on to serve on the “u196 board”. The u196 board, who were recruited via the district governance scheme, were all either local officials or very solid citizens who were accustomed to accepting civic responsibility. Meetings began in November 2011 and the u196 appointees sat solemnly through a number of excellent staff overviews of various topics concerning transit. But the acquiescence of u196 board members to discussion was not a promise that the political environment at home in the township would be favorable to an agreement on new taxes. As we detailed in this post about county politics, many townships have a long tradition of very low property tax millages, and a 1-mill tax would have been doubling tax rates for some townships, a very hard sell. And AATA leadership ignored the results of their own survey data (results from March 2012). Results by region: Would you vote for a 1 mill transit tax? Note that while 68% of respondents in the City of Ann Arbor said they would be likely to vote for a transit tax of 1 mill, and 56% of the urban core communities in Ypsilanti and Pittsfield were positive (combining “definitely” and “probably”), only 48% of those in the City of Saline and eastern townships, and 42% in Chelsea and western townships were positive. Of those, the greatest proportion were only “probably”. The overall percentages of respondents in 2011 who said they would be “definitely” vote for a tax was 18%, and 36% said “probably”, for a total of 54% positive responses. But that overall positive number did not take willingness to participate on a regional basis into account. Further, was this really a very strong positive result, even overall? Survey respondents are known to tailor responses to what they think the questioner wants to hear. Who knows what that 36% of “probable” voters would have done in the privacy of the ballot box? Somewhat disastrously, AATA appeared to take the position that any negative implications were to be ignored or explained, and positive ones the only to be considered. When six rural townships withdrew very early even from the planning exercises, AATA leaders like Jesse Bernstein began talking of population numbers and taxable value, in effect arguing that those townships didn’t matter. But these withdrawals undercut the premise of a countywide authority and set a precedent for non-participation. One move that AATA did make in the face of these negative indications was to reduce the target millage in an attempt to make a vote for a new tax more palatable. As mentioned in the last post, the Financial Task Force was able to reduce the proposed millage amount to 0.5 mills by excluding a number of projects from the cost of the plan (though AATA kept them in the plan and continued to spend money on them). But there was again a political miscalculation here. It was not a matter of the amount of the millage. It was the question of any new tax at all for the benefit being offered. Ultimately, AATA simply failed to make the sale. As we attempted to explain in an earlier post, for most sections of the county, the plan didn’t pencil out. Once AATA sent out letters to municipalities offering a 30-day window from October 3 for opting out (the date was later extended to December 10), there was a rush to the exits. By October 30, all but four governmental units had formally opted out. Faced with the likelihood that the new authority was likely to consist of Ann Arbor subsidizing transit for a couple of other nearby communities, the Ann Arbor City Council voted on November 8 to opt out of the Washtenaw Ride and also to cancel the city’s participation in the 4-party agreement. Opt-outs as of December 5. Only Ypsilanti City remains. 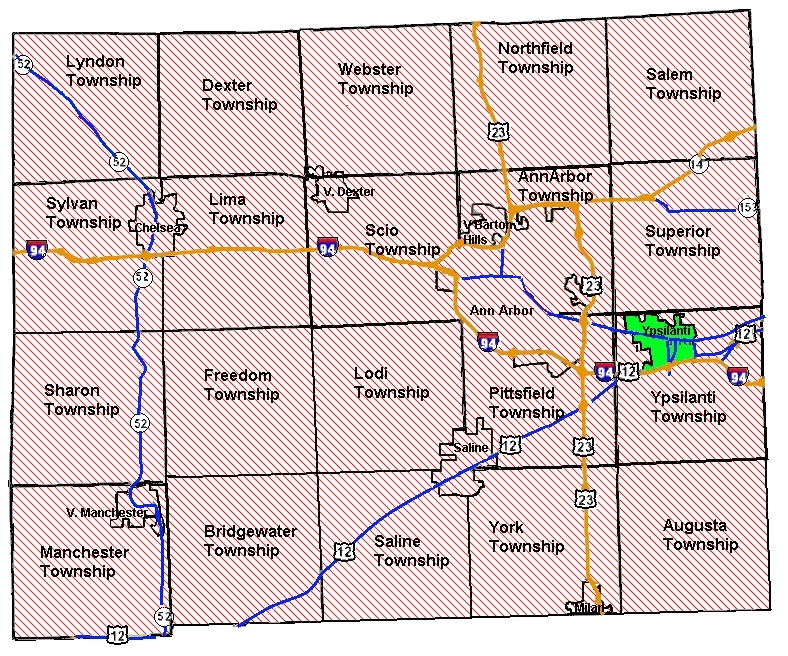 By the deadline of December 10, only the City of Ypsilanti remained in the Washtenaw Ride. As reported by the Ann Arbor Chronicle, the November 18 AATA Board meeting sought to put the best face on what was, in fact, a devastating rejection of their efforts to put together a countywide transit organization. Next: It’s all about the money. This entry was posted on January 1, 2013 at 1:20 pm and is filed under civic finance, politics, Transportation. You can subscribe via RSS 2.0 feed to this post's comments. You can comment below, or link to this permanent URL from your own site.